CHINA - For the third month in a row, EU pork exports were up on a year earlier in August, increasing by 10 per cent to 142,000 tonnes. This was almost entirely due to the strength of the Chinese market, with shipments more than doubling compared with August 2014. This is the third month in a row when sales of EU pork to China have reached new heights. At 47,900 tonnes, shipments were more than 5,000 tonnes up on the previous record set only a month before. 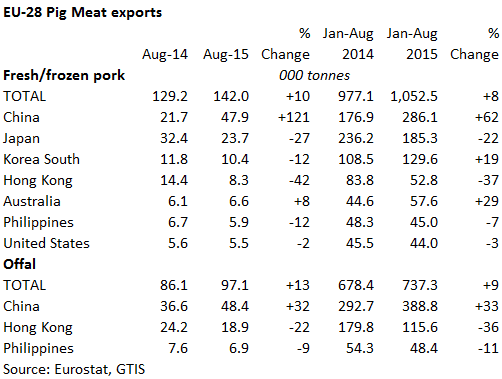 This growth meant that over a third of EU pork exports in August were destined for China. The importance of the Chinese market is emphasised by the fact that shipments to the other major Asian markets, Japan, South Korea, Hong Kong and the Philippines, all fell. These four markets accounted for over half of EU exports in August 2014 but this year took only 500 tonnes more than China did on its own. Despite the growth in volumes, lower prices meant that the value of exports was only 1 per cent up year on year, at €310.9 million, during August. The increasing diversity of cuts being shipped to China, however, was reflected in a 25 per cent rise in the unit price, meaning the value of this trade nearly trebled. Offal exports were also higher than a year before in August, rising 13 per cent to 97,100 tonnes. Again growth was led by China, which took virtually half of the total. Lower shipments to the other leading markets, Hong Kong and the Philippines, were offset by strong growth in a range of smaller markets in Asia and Africa.